Employees want to be recognized, appreciated and validated. The best way to do this is by rewarding them with awards and public recognition. We offer a wide variety of awards in all styles and price points to fit any need or occasion. We utilize several varieties of materials and finishes in conjunction with our unique design capabilities to create the exact piece for recognizing your achievers. Plaques, Crystal Glass, Marble, Granite, Metal Awards, Acrylic, Wood, Jade Glass, Recycled Materials, Custom Recognition Awards, and Handcrafted designs in Metal are examples or awards that we specialize in; all of which can be customized for any occasion. Today’s corporate environments utilize a large variety of items as symbols of recognition. Desktop recognition awards come in all shapes and sizes, and are limited only by the imagination. 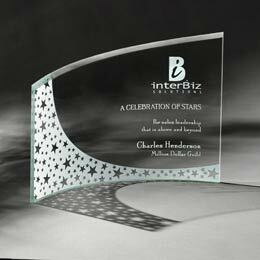 We can design your recognition objective into a one-of-a-kind, recognition award.